Author's Note: I decided to share the personal experience below because of all the e-mails I've received over the years from students who've failed a test or a class or come across an obstacle MUCH greater than not getting into a dream graduate program. This is for you. Do not give up. If you've been following this blog you know I recently interviewed as one of the top 50 for Harvard's EdLD program in Boston last week. It seemed as if I was one of the youngest being considered by far, and thus I did not make the top 25 who were accepted into the program. I found out last Friday night and to say I was crushed is an understatement. The first thing I said when I found out was: oh my gosh I'm going to have to tell everyone I didn't get in. I'm so embarrassed. Maybe they made a mistake. Yes! I'll get an e-mail and they'll be like, "sorry Isa, even though we're Harvard we just don't have it together and sent you the wrong email, you actually DID get accepted." That e-mail did not come. Even though rationally I know failure is integral to success and have read dozens of books on how to bounce back from failure, none of it worked in that moment. For example, platitudes like "you can get bitter or get better" went through my head. I knew I would get better. I knew I would come out of this. I knew I was still dedicated to my mission of helping students break the cycles of poverty through education. But in that exact moment I still felt bitter. And I questioned my worth completely. These questions consumed me: what am I doing? why am I trying so hard? what made me think I was good enough for this? should I just give up? have I set my sights too high? am I just the worst? am I not cut out for this? am I even making a difference? This is the ugliest place to be, and for a few days I felt absolutely numb. It's a place I knew I could not or would not stay, but it seems impossible not to visit, even for a moment, when failure happens. Though embarrassment is what I felt first, I knew I needed to get the telling of my failure over with. I emailed the handful of people who directly helped me get to the interview process with their advice and recommendation letters. I e-mailed close friends and family who'd been encouraging me all along. And I made the dreaded Facebook announcement. Then what happened next honestly shocked me. People said the kindest things that reaffirmed my worth and future, including the wonderful Harvard professors and current EdLD students who'd offered their gracious help in my application and interview process. Now of course, you know I'm the first to tell anyone that college acceptance does NOT define you. But like all advice, it's easier said than felt, especially in the depths of initial failure. I decided to sit back and just soak up what others were saying. When I was in the self-loathing stage it would have been easy to just say "oh they're just being nice" or "what they're saying isn't actually true." But instead I decide to let the encouragement wash over me. I decided to believe what people were saying was true, even if I didn't feel it in the moment. Because of other people's encouragement I began to hope. I wish I could say I had the strength all by myself and didn't need anyone to help me overcome this failure. 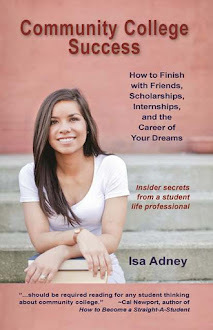 And in fact, my book is all about why other people - peers, professors, and professional mentors - are integral to success. We all need other people to tell us what they see in us in the dark times when we just cannot feel it ourselves. So let yourself go through the process, whatever that means for you, but don't do it alone. Tell people about your failures. Ask them for advice. Use failure to think about what you really want and other ways you can still get there. What also helped me hope again was my mission statement: helping students break cycles of poverty through education. While I'd failed at one of my goals that I thought would help me get there (i.e. getting into Harvard) I knew this wasn't the only route available. I could come at it from other directions, and that is just what I will do. Failure is not easy at all. Even knowing that pressing on after failure is a requirement for success doesn't make it any easier in the moment. In fact it's even harder than all the books prepared me for. In the moments when I felt heartbroken, hopeless, and numb I felt like I was also failing at "failing forward," which made it even worse. I think it's important to acknowledge the sadness. I no longer believe that people who find success after failure are those who never go to that dark place - I think the key is just that they don't stay there. Fail hard. Fail again. Build your strength. Don't do it alone. Act even when you don't have motivation. And write down what really moves you - that thing you really want, that you're really working for; that thing that moves you, excites you, motivates you. That thing that will keep you going even when your immediate goals don't work out. Have you written it down yet? Go ahead. Do it now. Read it every morning. And keep going.